For two weeks the First Iowa Infantry remained in camp at Keokuk, drilling and preparing for war. On the 13th of June, 1861, on order of General Lyon, the men embarked on a steamer for Hannibal, Missouri, and many of them looked for the last time on the Iowa shores. They were transported by rail to General Lyon's army at Booneville, where the day before that gallant and energetic officer had defeated and dispersed Governor Jackson's Rebel army in the first battle fought in Missouri. Here the regiment remained in camp until the 3d of July, and during this time Hiram Price, Paymaster-General from Iowa, who made the first payment for services. General Lyon, who now had an army of a little more than 3,000 infantry and one battery of artillery, determined to pursue Governor Jackson's Rebel army of nearly 7,000, which was retreating toward the southwest. On the morning of July 3d the pursuit began. The Fourth was intensely hot and as the soldiers marched along the dusty roads, shut in by woods in places, many were overcome with heat and compelled to fall out of the ranks. They had not as yet become inured to long marches beneath the broiling sun. At Grand River Lyon's army was reinforced by General Sturgis, with two Kansas regiments, a detachment of regulars and a battery of artillery, 2,800 in all. The army was now marching twenty-five miles a day and becoming more accustomed to soldier's life. The members of the First Iowa who died on this march, were the first of the many thousands of Iowa soldiers who perished in the war for the Union. On the 1st of August General Lyon overtook a force of the enemy under General McCulloch, at Dug Springs, and after a sharp fight defeated it. On the Union side the battle was fought by cavalry and artillery, the First Iowa Infantry acting as skirmishers on the right wing. General Lyon, who was now confronted by a superior army, Price having reinforced Jackson and McCulloch, sent urgent requests for more troops. But they were not furnished and, unwilling to remain idle while the Rebel armies were concentrating about him, he determined to attack rather than retreat. He formed his plan of battle, and on the evening of August 9th, the little army moved out of Springfield with 5,500 men to assail the combined Rebel armies, more than 20,000 strong. It was a desperate venture, but with no prospect of reinforcements, General Lyon was not the man to remain inactive until overwhelmed by the army surrounding him. Colonel Sigel was ordered to march by the Fayetteville road and open on the enemy in the rear with artillery, while General Lyon, with the main body, was to attack in front. 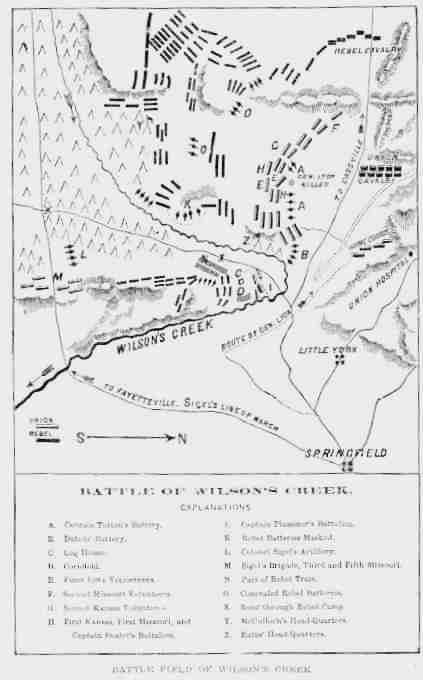 The Rebel army was encamped on Wilson's Creek. The First Iowa, under Lieutenant-Colonel Merritt, was with General Lyon. After a march of several hours in darkness and silence, the Union army, at 2 a.m., came within a short distance of the enemy and halted to take a few hours' rest. With the first dim light of the early morning the battle opened. Totten's Battery, supported by the Iowa regiment, from a hill, opened fire on the Rebels. To the left was Dubois' Battery, and to the right of Totten's were the First Missouri and Second Kansas regiments. "The First Missouri, the First Iowa and the First and Second Kansas Regiments, with Steele's Regulars, won immortal honor by the persistent and heroic gallantry with which for hours they maintained their ground against immense odds." Three companies of the Iowa regiment, H, I and K, were placed in ambush by General Granger of the regulars. Lying down close to the brow of a hill, they waited for another charge of the enemy. Soon it came in overwhelming numbers. Not a sound was heard among the Iowans until the Rebels were within thirty-five or forty feet, when they poured the contents of their muskets into the enemy, routing him, though suffering heavy loss themselves. General Lyon now ordered a bayonet charge by the First Iowa and Second Kansas regiments and led it himself. "Come on, brave men," he exclaimed, and they again charged the enemy, as the gallant Lyon fell mortally wounded. The command now devolved upon Major Sturgis. For half an hour the combat ceased, while each army was preparing for a renewal of the struggle. The remnant of the small Union force still firmly held its ground. Companies from the First Missouri, First Iowa and First Kansas regiments were brought up to the support of Dubois' Battery, which was assailed by the enemy; falling upon his flank, they poured in a murderous fire, killing or wounding almost the entire Rebel force. This was the last charge made on the Union lines, and the Rebels withdrew to a safe distance, badly shattered and demoralized. The Union army retired to Springfield in good order, its total loss in killed, wounded and missing being 1,235 men. The Rebel loss was probably about the same. The death of General Lyon was a loss to the Union cause that can scarcely be overestimated. In his brief career he had developed the rare qualities of great energy, fine military ability, promptness in execution and dauntless courage. At the time of his death, we had few officers in the service so valuable. Nowhere in the long war which followed can be found, in the great list of battles, one in which so small a Union army made so heroic and successful a fight against such superior numbers. The First Iowa lost in killed, wounded and missing, at Wilson's Creek, one hundred and fifty-five men, and no Iowa regiment during the entire war won greater fame on a battlefield. Three months before all of its members were civilians, and in ninety days they had become soldiers whose achievements were not excelled by veterans of any war. Soon after the battle the army returned to Rolla, and the First Iowa, whose term of service had expired four days after the battle, was sent to St. Louis, where the men were paid and mustered out. They had marched more than six hundred miles during their short term of service, showing endurance and valor unsurpassed. When they returned to Iowa, they were welcomed and honored everywhere. In the short period of three months they had proved, by long marches and heroic courage on the field of battle, that Iowa citizen-soldiers were superior to the boastful, slave-driving "border ruffians" of Missouri and Arkansas. They had won glory and renown by brave deeds which should be an inspiration to Iowa soldiers for all time. This pioneer regiment furnished many gallant officers to other regiments as the war progressed. Of Company A, Captain Marko Cummins became Lieutenant-Colonel of the Sixth Regiment; Lieutenant Benjamin Beach, a Captain in the Eleventh; Sergeant H. J. Campbell, Major of the Eighteenth, and Private R. B. Baird, Quarter-Master of the Thirty-fifth. From Company B, Lieutenant Harvey Graham became Lieutenant-Colonel of the Twenty-second; and Sergeants C. N. Lee and J. L. Gurkee, captains in the same regiment. Of Company C, Lieutenant W. Pursell became Major of the Sixteenth; Sergeant W. Grant, Captain in the Eleventh, and Corporal A. N. Snyder, Captain in the Thirty-fifth. Of Company D, Captain C. L. Matthies became Lieutenant-Colonel and Colonel of the Fifth, and later a Brigadier-General. Of Company E, Lieutenant J. C. Abercrombie became Lieutenant-Colonel of the Eleventh; Private W. J. Campbell, Captain in the Fourteenth; Private C. A. Cameron, Captain in the Thirty-ninth; and Private A. Roberts, Lieutenant-Colonel of the Thirtieth. Of Company F, Captain S. M. Wise became Major of the Seventeenth; Lieutenant G. A. Stone, Colonel of the Twenty-fifth; and T. J. Zollars, Captain in the Fourth Cavalry. Of Company G, Captain A. Wentz became Lieutenant-Colonel of the Seventh. Of Company H, Sergeant Charles Schaeffer became Major of the Fifth Cavalry, and a staff officer of General Curtis. Of Company I, Captain F. J. Herron, became Lieutenant-Colonel of the Ninth, and was afterward promoted to Brigadier-General and Major-General; Private David Greaves, Captain in the Twenty-first; Private D. B. Green, a Captain in the Third Missouri; Private N. E. Duncan, Adjutant of the Twelfth, and Private C. A. Reed, Assistant Surgeon of the Ninth. Of Company K, Sergeant J. H. Stibbs became a Captain and then Lieutenant-Colonel of the Twelfth; Sergeant Edward Coulter, a Captain in the Twentieth, and Private G. C. Burmeister, Captain in the Thirty-fifth. From its privates and officers, the First Iowa furnished, as the war progressed, officers of every grade from Second Lieutenant to Major- General.